MINEX Central Asia forum is organised by the network of mining professionals and businesses which has extensive and successful knowledge of Doing Business in Central Asia. The forum’s initiatives are actively supported by the local Government Agencies and Professional Associations. On behalf of Ministry of Industry and New Technologies of the Republic of Kazakhstan, I am delighted to welcome all participants of the 3rd MINEX Central Asia 2012 Forum which will be held in Astana on 17-19 April 2012. The Ministry supports the Forum’s initiative to develop in Kazakhstan a major international mining and mineral exploration event which will stimulate professional dialogue on exploring and developing mineral potential of Kazakhstan and Central Asian Countries. Development of the mining sector plays vital role in the development of regions, as well as creating new industrial and service businesses. Currently, Kazakhstan is going through important changes – creating more attractive conditions for growth of the mineral exploration and efficient regeneration of the mineral resources; subsoil use regulation is being strengthened; high-tech solutions and automated management technologies in mining and mineral exploration sector are being implemented; data on mining and mineral exploration results is being systematised and upgraded; extensive works are carried out to develop sufficient infrastructure and create favourable conditions for training workforce and meeting current industry requirements. I am certain that MINEX Central Asia Forum will stimulate further growth of the professional networks and assist practical know-how exchange and business cooperation. I also believe that it will generate practical recommendations for more efficient cooperation between the State and private sector in achieving the goals that have been set for the industry. To all participants, organisers and guests I wish productive and successful work at the forum! Dear ladies and gentlemen, colleagues! On behalf of the Ministry of Economic Development and Trade of the Republic of Kazakhstan, I would like to welcome participants of the third mining forum «MINEX Central Asia 2012» which will take place in Astana on the 17-19 April, 2012. Organisation of systematic mineral exploration using modern technologies, as well as creation of favourable conditions for attracting investments in search and development of new mines is an important task which will ensure sustainable growth of mineral resources and assist implementation of industrial and economic development programs in Kazakhstan. «MINEX Central Asia» forum proved itself to be a respectable international platform that stimulates exchange of the practical knowledge and international experiences concerning the rational management of natural resources; technical modernisation of the mining organisations; improvement of production quality; possible diversification from the raw material manufacturing into making of the technologically advanced, high value products; power efficiency and sustainability of the manufacturing. I’m confident that the «MINEX Central Asia» forum will continue to promote further cooperation between business partners, establishment of new connections and will help to develop some practical recommendations on effective collaboration of the state and corporate sectors to address the challenges faced by the mining industry. I wish all the participants, organisers and visitors successful and productive forum. On behalf of the Eurasian Business Council I would like to welcome all participants of the 3-rd International Mining Forum « MINEX Central Asia 2012 » which will take place in Astana on 17-19 April 2012. 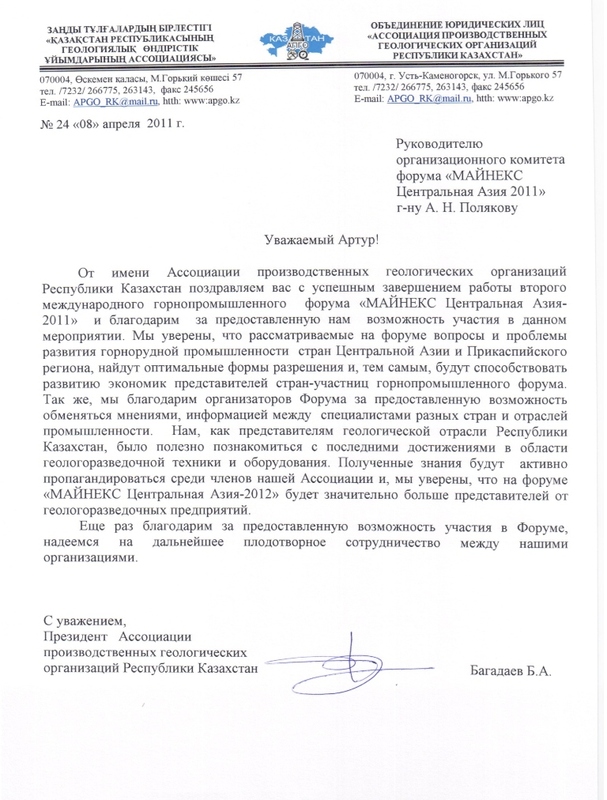 2012 is an important year for Kazakhstan and other Eurasian Economic Community members. On the 1st of January 2012, the treaty on the establishment of the Common Economic Space on the territory of three Eurasian Economic Community (EurAsEC) member states – Belarus, Kazakhstan and Russia came into force. Following an introduction of Freedom of movement and Customs Union, Common Economic Space establishment opened a new stage in the Eurasian integration process. The next step will be formation of the Eurasian Union, as indicated by the Presidents of the member states in their official speeches. Under the leadership of Mr Nazarbayev, the Republic of Kazakhstan continues to progress with confidence towards establishment of modern, economic regulation mechanisms and state institutions appropriate for the current economic climate. 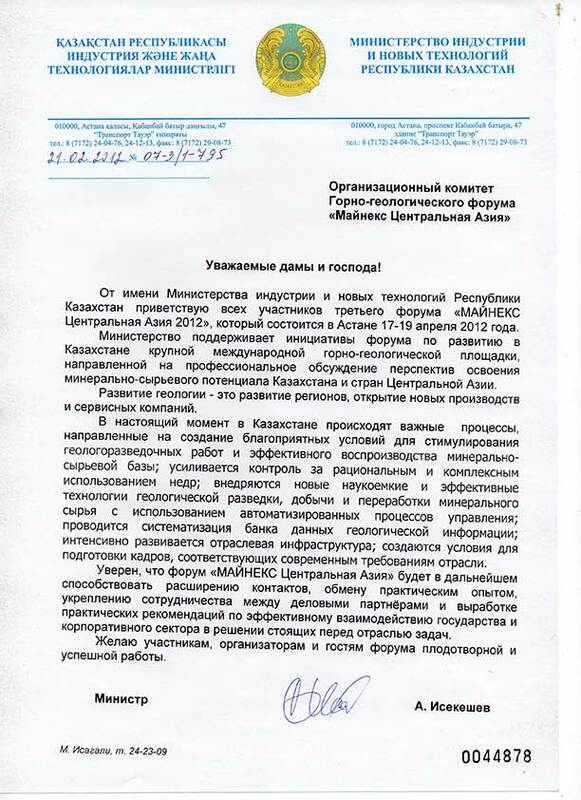 A convincing victory by « Nur Otan» party at the early Majilis parliamentary election held in Kazakhstan in January 2012 has demonstrated Kazakh citizens’ approval and support of the government program, as well as their trust in the economic development policy of Kazakhstan. This outcome was expected. Summing up the results of the first two years of the government’s industrialization and innovation enforcement program in Kazakhstan for 2010-2014, experts noted a potential growth of manufacturing industry. For the first time in many years, the growth rate of processing and manufacturing in 2010 at 18,4 %. Has exceeded the growth rate of mining. Whereas, the growth rate of mining sector was 5,4 % in 2010 which was sustained in 2011. Balanced development of the industrial sectors: mining, processing and related industries such as transportation and logistical infrastructure, are of a greatest importance to the long-term competitive development of Kazakhstan and Common Economic Space. All the above mentioned issues will be addressed at MINEX Forum, which offers an expert platform for open professional dialogue between business organisations and state institutions on development and growth aspects of mining in Kazakhstan and Central Asian region. I wish all forum delegates success in their business endeavours, as well as peace and prosperity! On behalf of The Association of mining and metallurgical enterprises of Kazakhstan, we would like to thank the Organising Committee of the forum “MINEX Central Asia 2012″ for their efficient and professional approach to organisation of the forum. Traditionally, the standard of the forum is very high, as it seen both in the high level of the participants it attracts, and in the importance of topics discussed, i.e. geology, subsoil use and mineral resource development in the Republic of Kazakhstan. As a regional partner of the forum, The Association of mining and metallurgical enterprises, is ready to continue to fulfil its’ role as a member of Technical committee and also will be pleased to join the Supervisory board of the forum’s secretariat. On behalf of The Association of Geological and Exploration enterprises of Kazakhstan (APGO) we would like to congratulate you on the success of the second international mining forum «MINEX Central Asia-2011» and to thank you for an opportunity to participate in the event. We are certain that the topics raised during the forum and problems associated with the development of the mining industry in the countries of the Central Asia and near-Caspian region, will find optimal solutions and, thereby, help the development of economy in the participating countries. Also, we would like to show our appreciation to the organizers of the forum for a providing a platform for an exchange of opinions and information between experts from the different countries and industries. As representatives of geological industry of the Republic of Kazakhstan, we found it useful to learn about the latest achievements in exploration technology and equipment. We will be spread our newly acquired knowledge among the members of our Association and we are certain that next forum «MINEX Central Asia 2012» will attract more representatives from the exploration enterprises. Once again we thank for a chance to participate in the forum, and we are looking forward to the further successful cooperation between our organizations.